The concept of “Pivoting” or moving into a different category than one started out with is common in the startup world. However, rarely does it happen that the founder of a company quits to start another company into a completely different vertical. Bangalore based social intelligence startup Simplify360’s founding CEO Bhupendra Khanal has quit the company to start a dog food product company. The company will sell the food under the brand name “Dogsee Chew” and will be focussed on high quality and healthy packaged foods for dogs. Dogsee Chew is self-funded at the moment. The dog lover in Khanal encouraged him to take the plunge and start it. Khanal hails from Nepal and he started his career as an analytics professional & soon founded Simplify360 with 2 others. After having successfully headed the company for 7 years, Bhupi took an exit to follow his dream of doing something in the food industry. It was while on a trek in Elam, a small district in Nepal, he found local stray dogs with shining furs, perfect teeth & overall with a great amount of energy. When he interacted with the villagers, they revealed that these dogs often chew on ‘Churpi’ that villagers sometimes throw out or don’t use. This came as quite a surprise to Bhupi as Churpi or Hardened Yak Milk Cheese is something that he has known & ate all his life but never thought of as dog food. A little more research later, ‘Dogsee Chew’ was born! Like any passionate startup founder, Khanal has been personally tweeting and sharing updates on his latest venture. 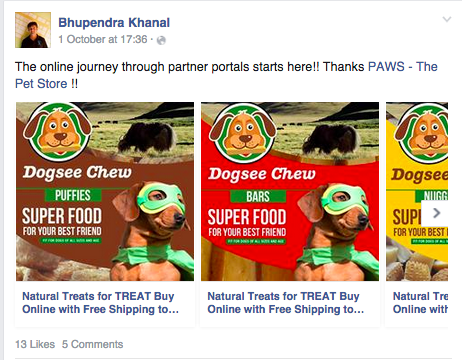 Looks like the likes of Pedigree, Purina and IAMS may finally have an Indian competitor.